Ian Chappell said the only coach required for an Australian cricket team was the one that transported the players around England. Chappelli believes the captain to be the main man and a coach surplus to requirements. If the advent of the coach has meant that the captain has lost a bit of the hegemonic role in professional cricket, he is still the el supremo in the lower forms of the game. The job of cricket captain asks the most of any sports leader and can be overwhelming for many. In the amateur game he must do everything from find ten other players, organise lifts to the ground, collect the fees, provide the ball and many other travails. After organising all this and more he then must start to think about running the cricket side of things. Good luck. Thankfully Charlie Campbell has come to the rescue and provided a treatise on the role of, in particular, the Sunday amateur captain. Campbell is the captain of The Authors XI. To qualify for his team you need to have had a book published. Campbell takes the potential volunteer captain through the myriad of problems they may face and provides some useful clues on how to spot the false hope. One clue is to be on the lookout for the wrong terminology; for instance the tall athletic player who looks like he can bowl thunderbolts until he sums up his style as “inside fast”. Campbell ignored this non cricket lingo and paid the price as the “inside fast one” sprayed the ball to all parts. The premise of the book is based on one of the all time canons of cricket literature, The Art of Captaincy, by Mike Brearley, who writes the forward for Campbell’s book. Charlie Campbell tackles many of the same questions that were posed by Brearley, and perhaps surprisingly, he is able to find similar comparisons with the first class game. “a few hundred years ago he would have been patrolling the taverns in a seaside town, pressganging unwary drinkers into going to sea. At risk were “eligible men of seafaring habits between the ages of 18 and 55 years”. The amateur captain is not in a position to be so fussy”. 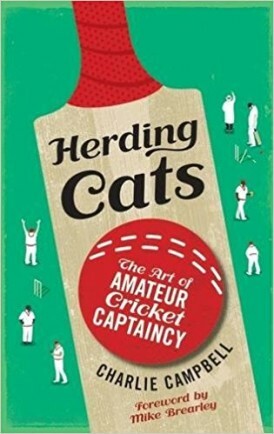 Anyone who has played cricket at a low level and especially those who have captained an average team will relate to Herding Cats. Add high quality writing and it is a great read. The 100th anniversary of Don Bradman's birth has seen yet more books dedicated to the memory of the legendary cricketer.